In Chrome, click the Chrome button in the top-right corner. Choose Save Page As. The Save As dialogue box appears (see Figure 1). Alternatively, you can press Ctrl+S in Windows or Cmd+S on a Mac to call up the Save As dialogue box. In the left pane, navigate to where you want to save the web page. In the File Name field, give the web page a name if the one supplied isn’t to your liking. Note that Chrome automatically gives the web page the same name that appears in the title bar of the browser, which may be too long or not particularly useful. Webpage, HTML Only: This option saves only the HTML of the page — that is, the code that the browser reads and interprets in order to display the page. It doesn’t save images and other types of files. Later, when you open the page in Chrome, you’ll notice that only text will appear on the page, without all the visual noise surrounding it. Webpage, Complete: This option saves everything that Chrome needs to display the web page as it would appear if your visited it in real time in your browser. Don’t choose this option if all you’re interested in is the text on the page; otherwise, you’ll download a bunch of stuff you don’t need and take up valuable space on your hard drive. Figure: 1: Saving a web page with Chrome. The web page is saved to your computer. 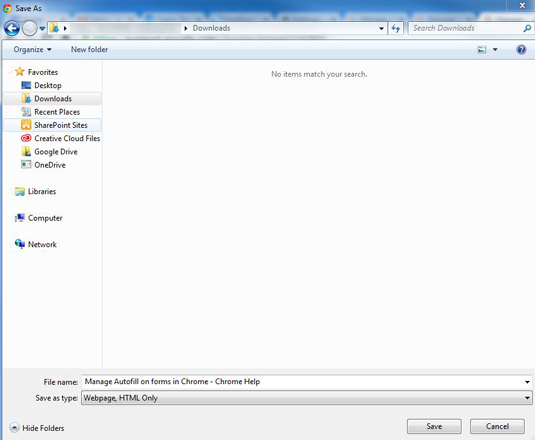 Now, navigate on your computer to where you saved the file and open it. It’s probably best to open the web page in Chrome, since you saved it in Chrome; other browsers may have problems displaying it correctly. Many web pages have advertisements on them. When you save a web page using the Complete option, you get every single item that the browser needs to display that web page. And if the web page isn’t constructed particularly well, you may end up with those advertisements displaying in odd places, such as smack dab in the middle of your text. That’s why if you’re interested in only the content, the HTML-only option may be the way to go.